Have I ever got a fun post to share with you today! It’s been hard to wait and not post too early! I love my photos, I had fun with the photo shoot and fall is just so much fun. So beautiful and wonderful and amazing. And my little garden shed in my back yard was the perfect backdrop for a Fall Picnic. A picnic that involved plaid blankets to sit on, cedar wood slices for a centerpiece, beautiful, scrumptious caramel apples, fresh pressed cider to drink, popcorn and more apples for beauty and for more munching. 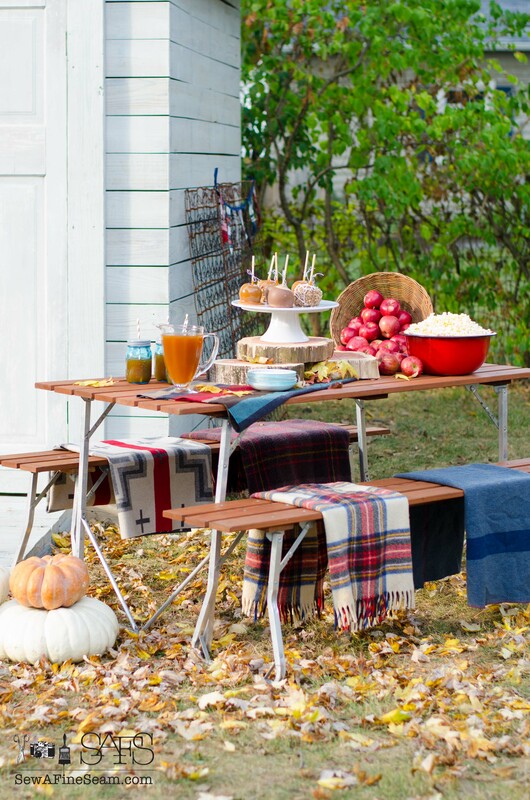 I created this Fall Picnic with elements I had on hand, like the plaid blankets, the vintage table and benches, the old bedspring and the plaid pennant banner in the background for a bit of fun, easy decor. 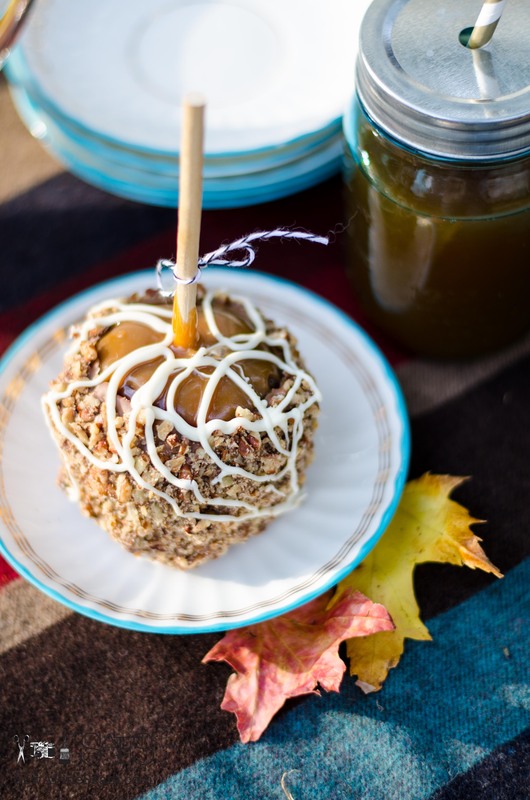 I purchased the most amazing dipped apples from Winan’s a local coffee shop. I have to take the time to insert here that my cider came from Downing Fruit Farm. Best apple cider ever. I took my girls there on a field trip a few years ago. They informed us that a secret to their wonderful blend is that it IS INDEED a BLEND! 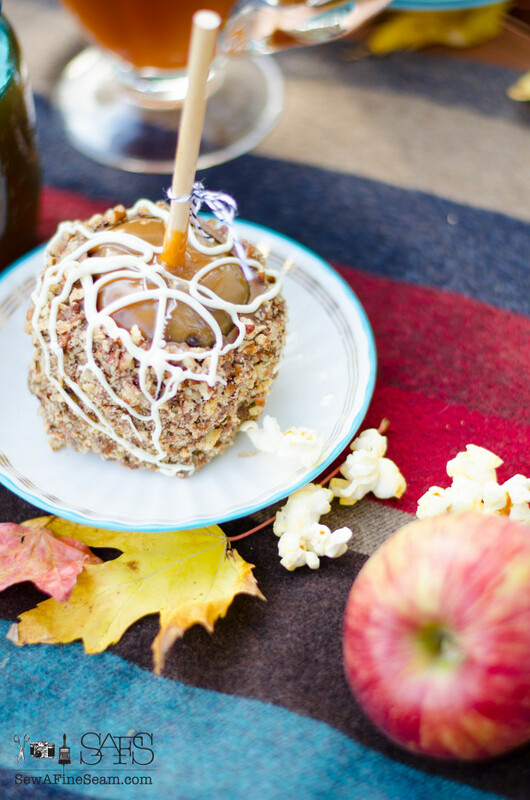 There are at least FIVE different kinds of apples in every batch. It works. Every drink of cider I’ve ever had from them over the years has been wonderful. 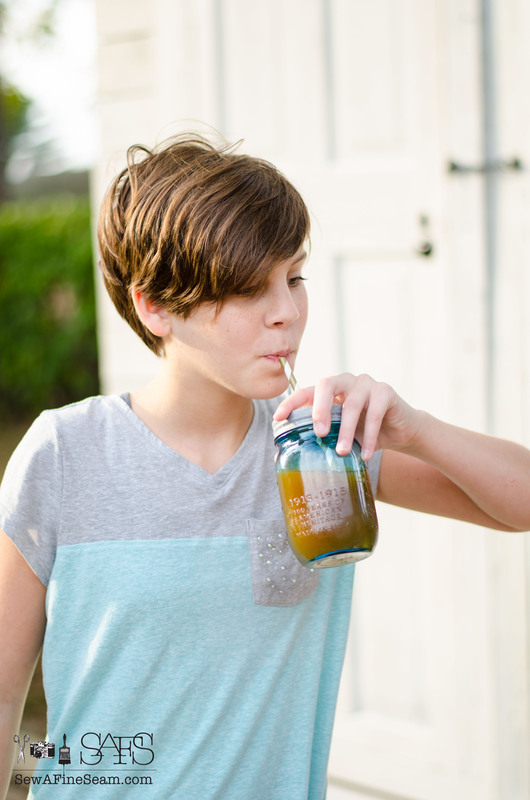 And the best way to drink it is to freeze it and then let it thaw in the fridge and start using it when it’s all slushy. Yum. And popcorn. 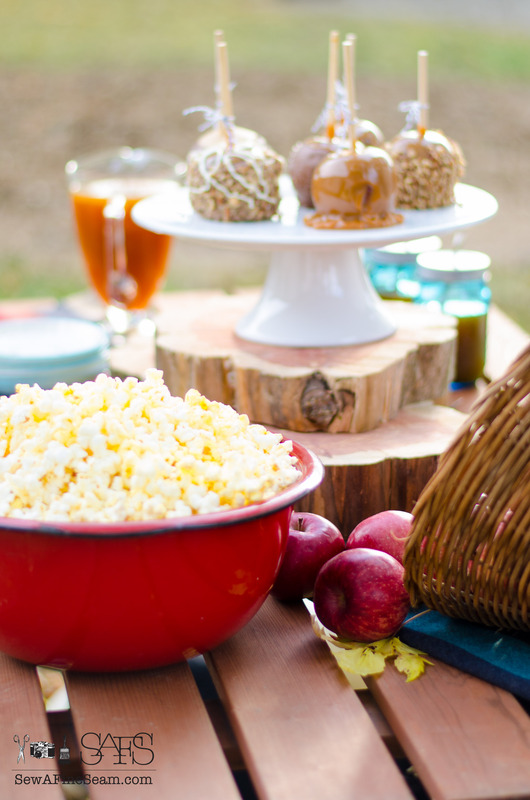 Gotta add the popcorn for a Fall Picnic like this. 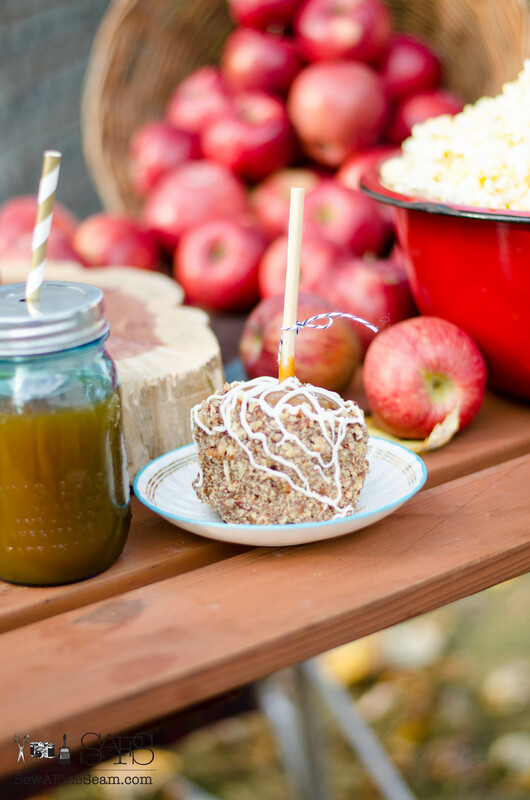 Popcorn and apples and cider. 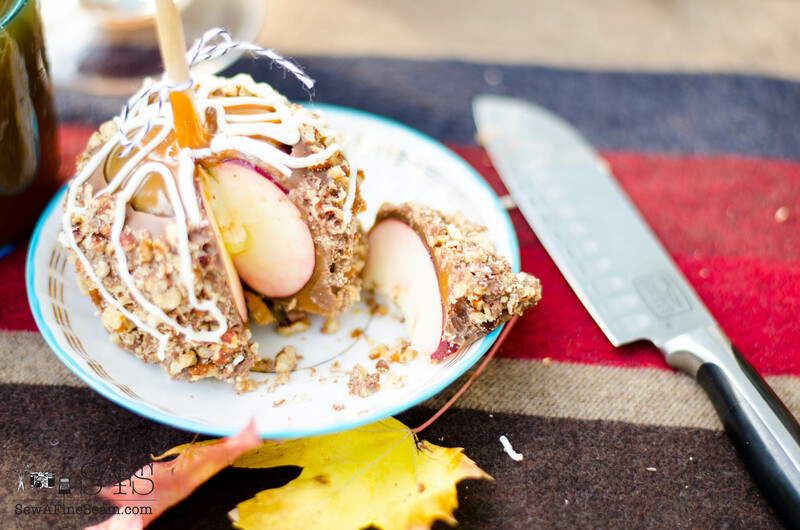 And the dipped apples for dessert. 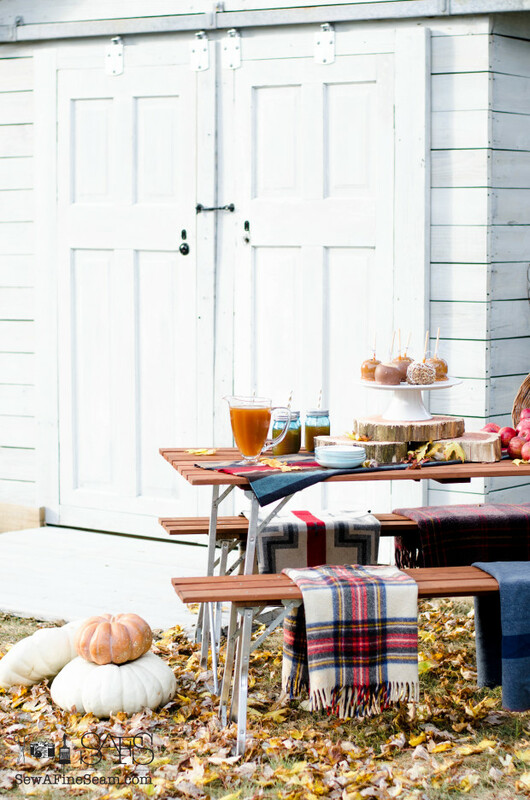 What more could you want at a Fall Picnic?! I used a wool fabric piece folded in thirds for to put across the table. I love plaids and wool for fall. The cedar slices of wood are from a cedar tree we cut down on our property years ago. The log has been lying along our side fence row ever since. When I was fluffing the house a couple weeks ago for a Fall Home Tour I asked my husband if he could saw up that log for me. I love the color and texture of the log slices for fall and the three slices stacked perfectly for a centerpiece. 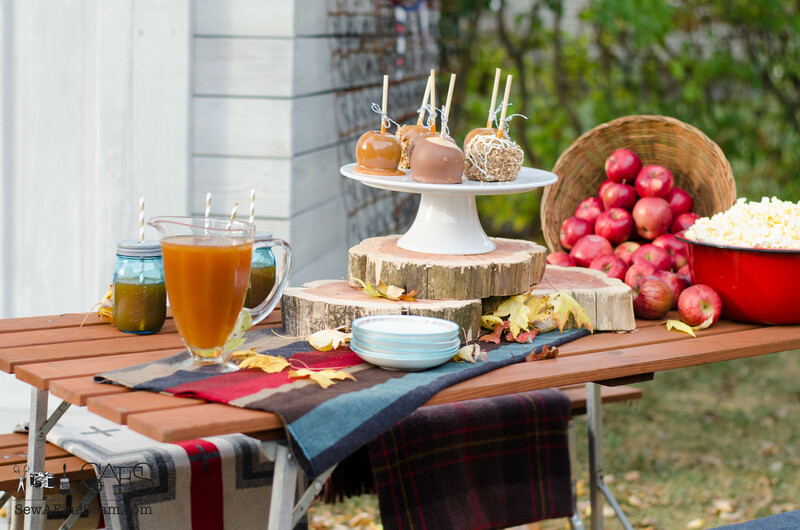 All I had to do for this Fall Picnic centerpiece was add my white pedestal cake plate filled with the luscious caramel dipped apples. The darling little garden shed in the background sits in my back yard. I will pull together a post one of these days and show you what it started as and how it came to be in my back yard. We just got the white stain added to it earlier this fall and I am loving it so much. The doors we created ourselves using some old doors salvaged from an old house. In fact, everything about this little building is salvaged at this point except the stain and maybe a small bit of hardware. I’ll have to double check with my hubby when I get around to putting the post about this building together. The Deluxe Dipped Apple. Caramel, Chocolate, pecans, drizzled white chocolate. Divine. Wool blanket. Pretty leaves. Red Delicious. Popcorn. 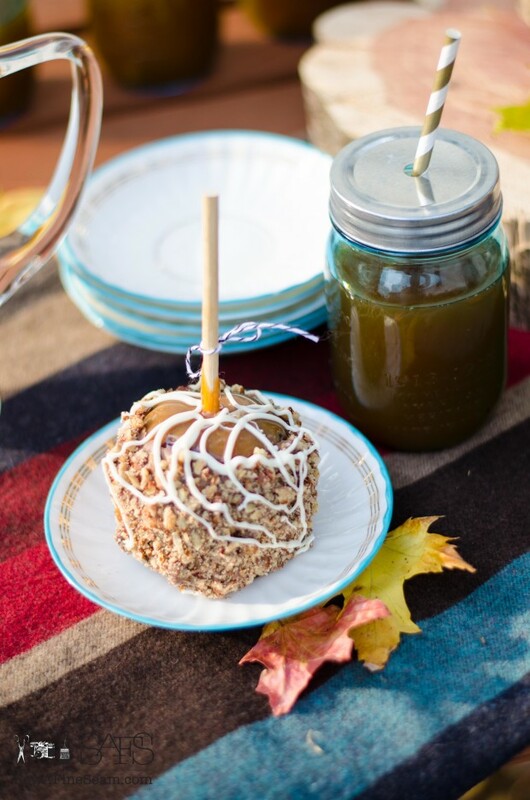 Deluxe caramel apple on a vintage china plate. Fall – it’s beautiful, awesome, and inspiring. Our yard doesn’t have a lot of pretty leaves. We have a TON of leaves, just not pretty ones. And my hubby keeps them cleaned up pretty well as they start coming down. So when I was styling this table for my photo shoot I thought we needed some pretty leaves on the ground for more of a Fall feeling. First my daughter went over to the neighbors and filled a bag with some pretty leaves. I used those on the table. Then we decided we needed a bunch UNDER and AROUND the table. Sack fulls weren’t really getting us the look we needed so we used got the wheelbarrow and hauled in a wheelbarrow load. About halfway through I felt a bit guilty about dragging leaves INTO the yard when my husband worked most evenings to get the leaves OUT of the yard. The caramel on these apples tastes like it was made in your Mother’s kitchen just this morning. It is truly the best ever. The real stuff. 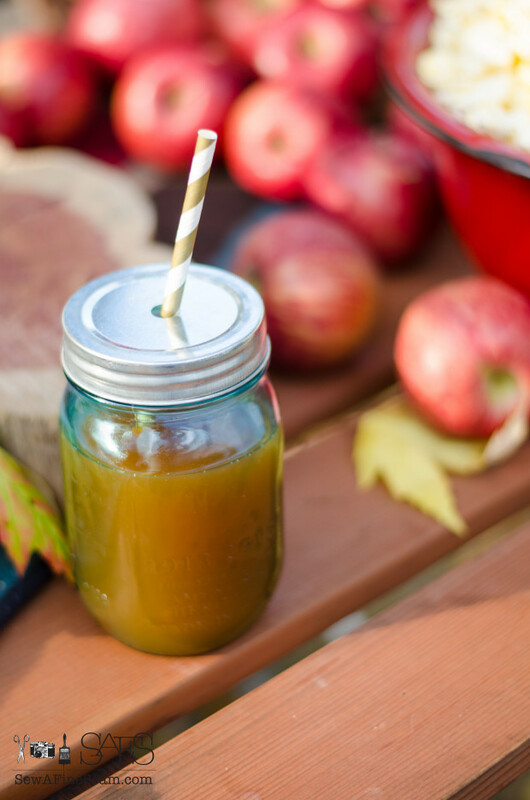 5 different kinds of apples pressed into a beautiful, delicious golden brew. Never cooked, all the nutrients and deliciousness in their pure, natural form. This family loves the stuff as you can see here – I could hardly hold them back from the goodies on the table long enough to get all the shots I wanted! The vintage table and benches we found tucked up in the rafters of the garage at my Grandma’s house when we were cleaning out my Grandma’s house. I promptly claimed them. I plan to paint them white come springtime. Jill, your Fall picnic is absolutely stunning! Your styling, your photography … just beautiful! You knocked this one out of the park!! Can I come over? You just charmed the sleep off of me. Such beautiful photos, such a well written inviting piece. Everything looks so yummy. And I also have a confession to make. The leaves that I found were dragged out of the sea. So everyone has an unusual story to tell. You are welcome to come by! And I love that you pulled your leaves out of the sea! Your post looks like something out of Country Living Magazine. Just gorgeous! AAHHH thanks Lucy! I only wish! Um, hi, this is amazing! 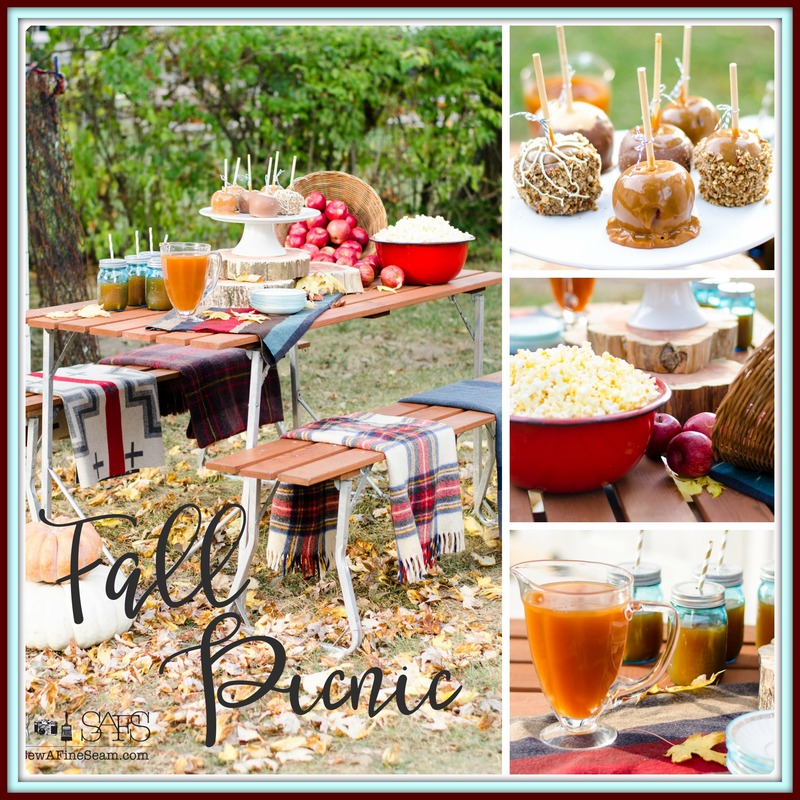 I want to come to your fall picnic! Everything looks so perfectly autumnal! Come right on over! Wouldn’t it be fun to have a blogger meetup over a picnic like this?! I can see us all now – jockeying for position to get photos before we sat down to enjoy the goodies! Yum, I’ll be right over! 🙂 Everything looks amazing! Sharing everywhere. This is jaw dropping gorgeous, girl! I WANT! Stunning post, Jill! Your photography is over the top! Thanks so much Donna! Yes, a big glass of cider and the yummy apples helped with the pile of leaves I’d dragged in I’m sure! The awesome leaf blower he got for Christmas last year didn’t hurt either 😉 He didn’t know why I’d need to rake them up – he rather likes cleaning up the yard since he has that thing! It’s a husqvarna and has a ton of power. 🙂 Thanks Kimm! I love plaid – I see a collection growing cause I’m loving finding wool plaid at thrift stores and antique shops! Jill I know I already told you this but I had to stop by and tell you again, this is just stunning! Thank you Pamela! It was a fun one to set up and shoot! I love this! 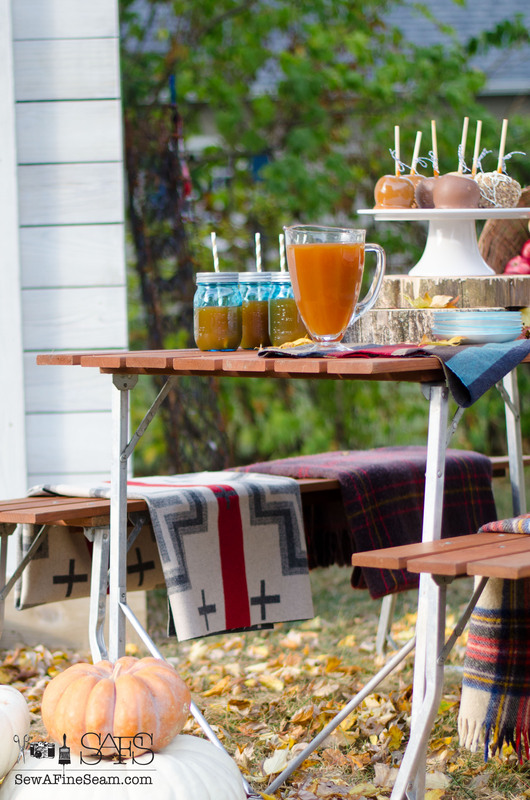 I would love to enjoy some hot apple cider at this table. Oh yes, Lindsay, hot apple cider is yummy! 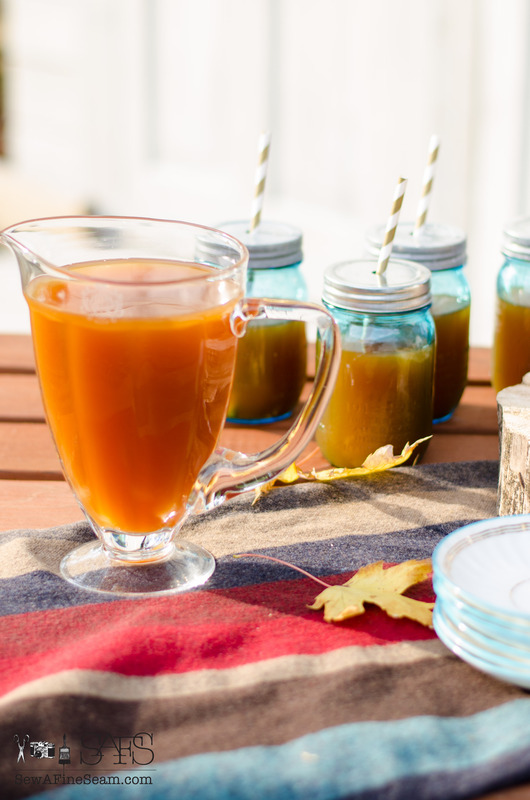 Add a cinnamon stick and it’s the perfect thing to cut the autumn chill! Gorgeous everything!!! The apples (clothed and naked) look delicious. You can’t beat fresh pressed apple juice – I have a gallon in my fridge I brought home from Brookings, Oregon – they have antique apple presses and they will press your apples for free one Sunday a year…and I hit the right day, oh yeah!! Definitely going to try your freeze/thaw to slushie!! BTW, it took 4 5 gallon buckets of apples to make 2.5 gallons of apple juice! Thanks Susan! Crazy how many apples it takes to get cider huh? cool that you got yours pressed for free 🙂 And the slushy – oh my. We had it that way the first time when we went on a field trip to the Downing fruit farm. They have a machine that freezes it – like frozen coke. and they gave everyone some – worth braving the rain and cold that day for the field trip! I stopped reading this mid-post to see where the closest Winan’s was to me. A coffee and apple is just what I need at the moment. 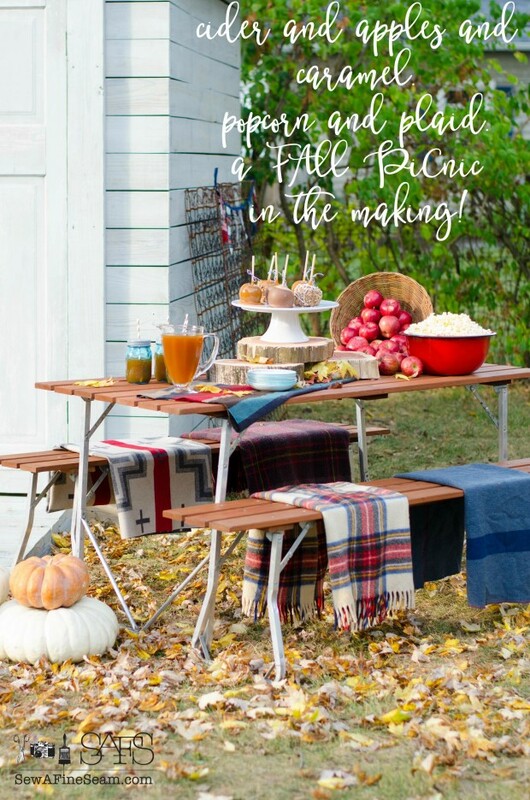 Love the picnic table and benches! Is that a blanket or fabric on the bench (gray and red)? It’s the best Kellie! 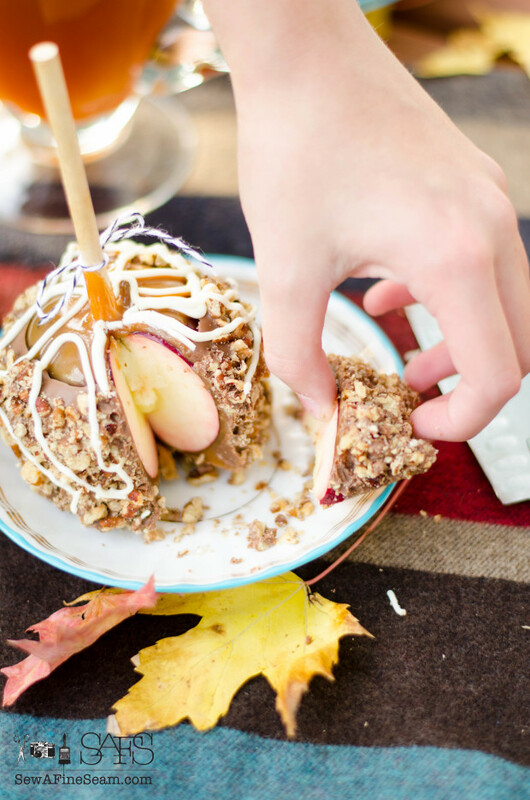 Come over – I’ll treat you to coffee and an apple! The red and grey with no fringe is a pendleton wool fabric. I’ve had it for a couple years – bought it at a fabric boutique in Indianapolis. Come on over Jami! 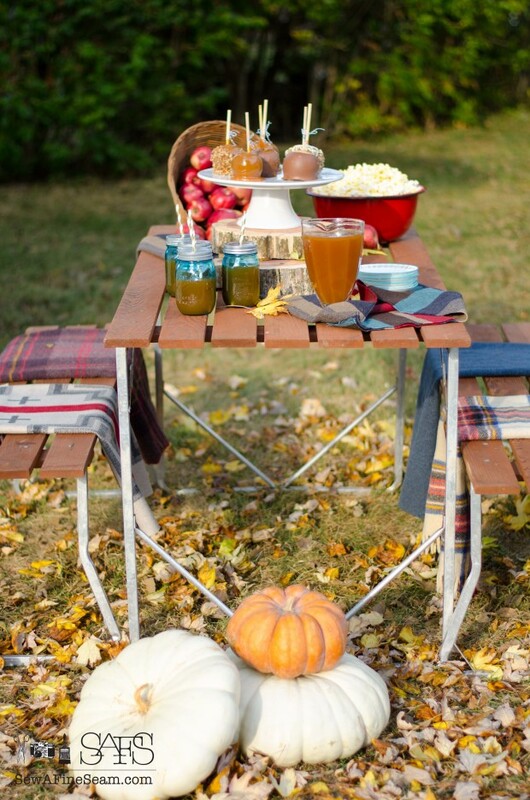 I’d gladly set up another fall picnic if you came over!! Your photos are gorgeous. I had a hard time deciding what to pin, because I wanted to pin them all! Awww, thanks Pam! I was quite happy with these photos – the lighting was perfect that day! Thanks Andrea – I had to laugh a bit at the ‘fun momma’ cause my girls think it’s so unfair that I won’t let them eat the goodies till I’ve got it all set up and photographed! LOL!! They did get to eat it all and drink the cider but they thought it was quite a pain that I made them wait! What a lovely picnic! 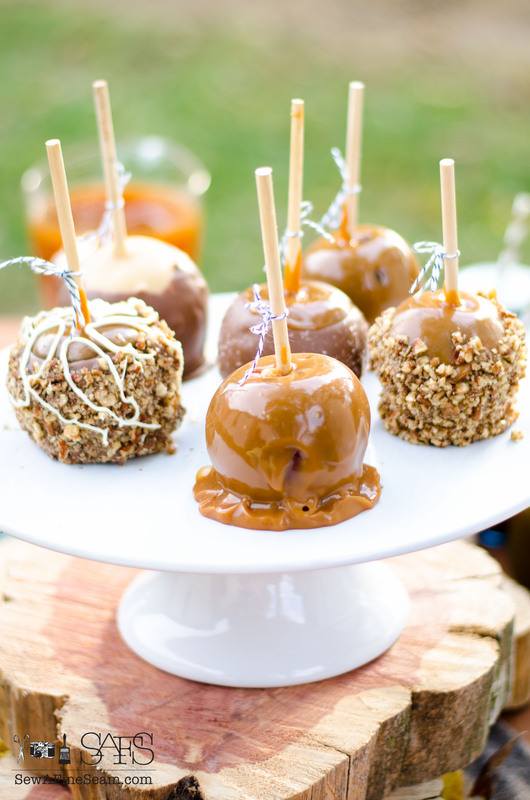 I love how you included candy apples! My favourite in your setting are the blankets on the seats. They really caught my eye. I also love your photography! I did notice the leaves and think WOW! what luck that you had such gorgeous leaves. Thank you for being so truthful that they came from the neighbour. Too funny! Thank you Thea 🙂 The blankets on the seats was a last minute idea. I had this all in my head and was hoping it would all translate right when I pulled it all together. I loved the look too and was so glad I thought to grab my wool blankets and fabric pieces when I was hauling it all outside to set up. And the leaves! I’m glad our neighbor has pretty leaves! The house is actually empty right now as it’s for sale, so the leaves were piled pretty high with no one there taking care of them. We had no problem filling a wheelbarrow for our use!! I love every bit of it! I so wish I could’ve been there. I’m longing for cider from Downings and those apples are too fun!!! Love how you can slice them for easy gobbling! The garden shed looks so good all finished and whitewashed! Love the popcorn in that red bowl! I’m itching to set something up now and pick up my camera! lol! I forgot to say that I love that you hauled in leaves and that sounds so like T to calmly have their disposal figured out. And I love your fonts in this post! How fun! 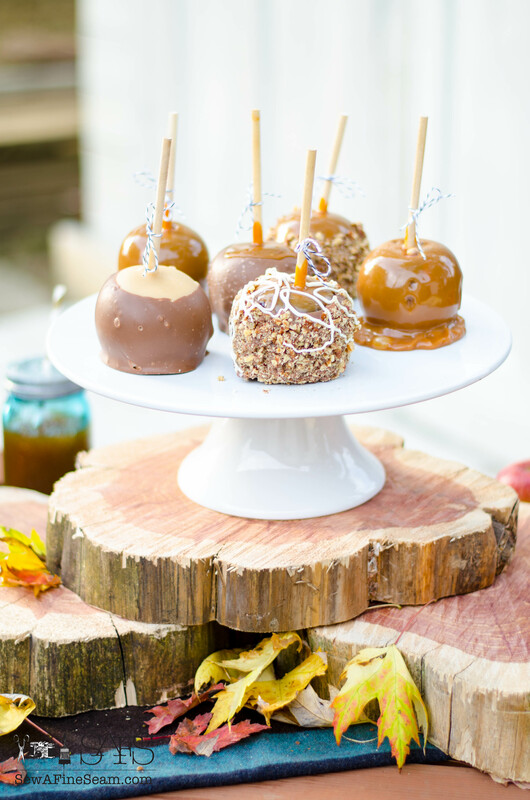 I love how you created this stop and the candy apples look so yummy. Beautiful fall decor and so warm feeling I got just looking at your pics. This is such a gorgeous display! Those apples look amazing and the blankets on the bench make for such a cozy place to hang out on a cool fall evening. Love it all! how enchanting! jill you got all my favorite things in one post: picnic, fall colors, crisp air, and crunchy leaves under a big tree… love love! Love your fall picnic! 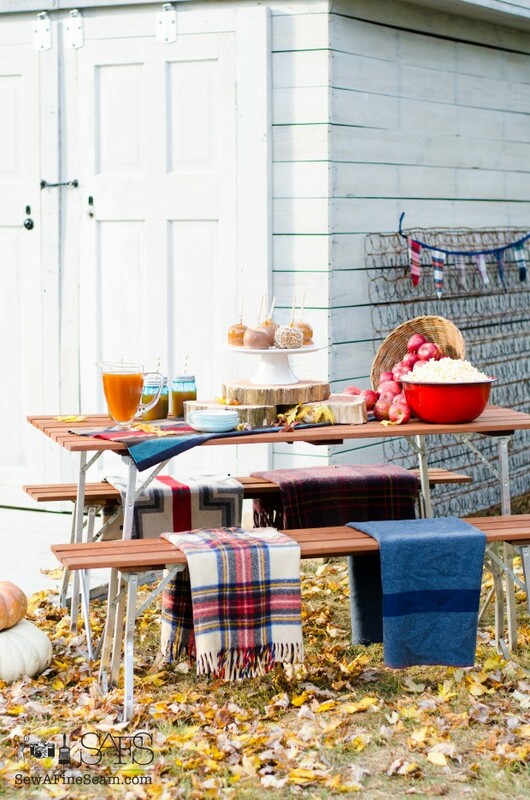 Am in love with the vintage picnic set! Does not need to be painted, in my opinion, love it in the rustic color! Wish I had those apples! Happy Fsll!